Voici un ouvrage de premier plan concernant l'étude de l'orchestration (comme son nom l'indique). 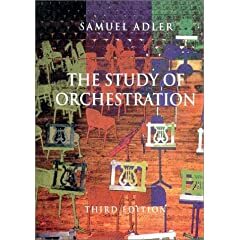 The third edition of this high successful orchestration text follows the approach established in its innovative predecessor: Learning orchestration is best achieved through familiarity with the orchestral literature; this familiarity is most effectively accomplished from the music notation in combination with the recorded sound. The text has been revised to reflect the most informed reactions to the first and second editions, as well as Professor Adler's revisions. For comprehensiveness, conciseness, and contemporaneity, The Study of Orchestration remains without peer. ça c'est bon!Par contre 864 pages,et en anglais en plus! y a pas quelqu'un sur le forum qui voudrai le traduire? L'anglais, c'est bon pour la santé.